You might remember that my sister was one of the fabulous four who threw a blessingway for me last summer. I wish every expectant woman was given a Mother Blessing or Blessingway. We don’t have enough rituals surrounding the transitions in our lives. For Noelle’s celebration, I chose a few special rituals to honor her. 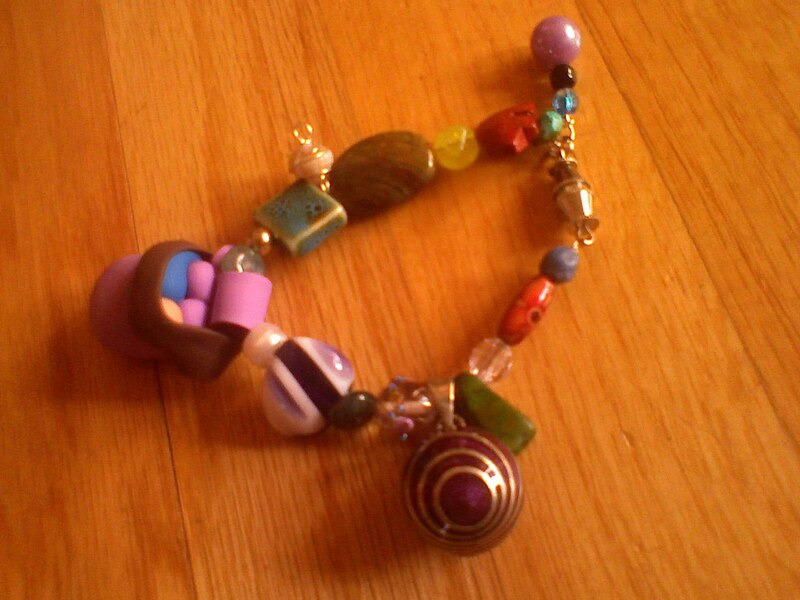 Each guest brought a bead to be made into a birth bracelet for Noelle during Asher’s birth. Everyone had such amazing beads! My mom made a pendant containing beads that belonged to her, her mother, and her grandmother. Noelle’s mother-in-law found a fantastic bead featuring a babywearing mama. One friend gave Noelle a bead from a necklace she bought during their first overseas mission trip. Take a look at the gorgeous bracelet. Each of us also wrapped an ankle or wrist in a Mothercord. We’ll wear this cord until Asher is born; each woman using the cord to remind her to pray for Noelle’s birth. I had Noelle’s mom and her mother-in-law each braid a side of her hair. 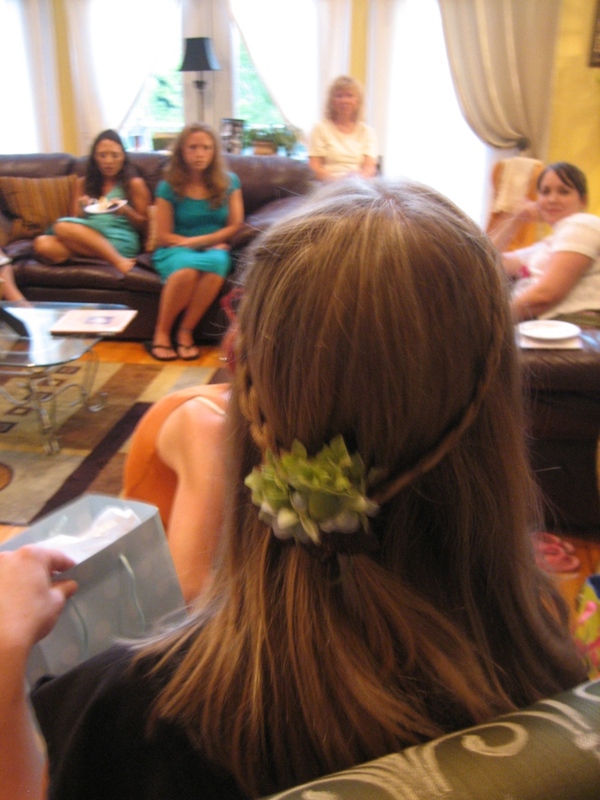 In the back, I joined the two braids with a hydrangea flower from our grandmother’s garden. Our grandmother is no longer living and I wish I’d asked her more about her own births. I know that she had all her children at home except her last born, my mother. I set up a table for an art project. Each guest was invited (ok, ordered) to participate. 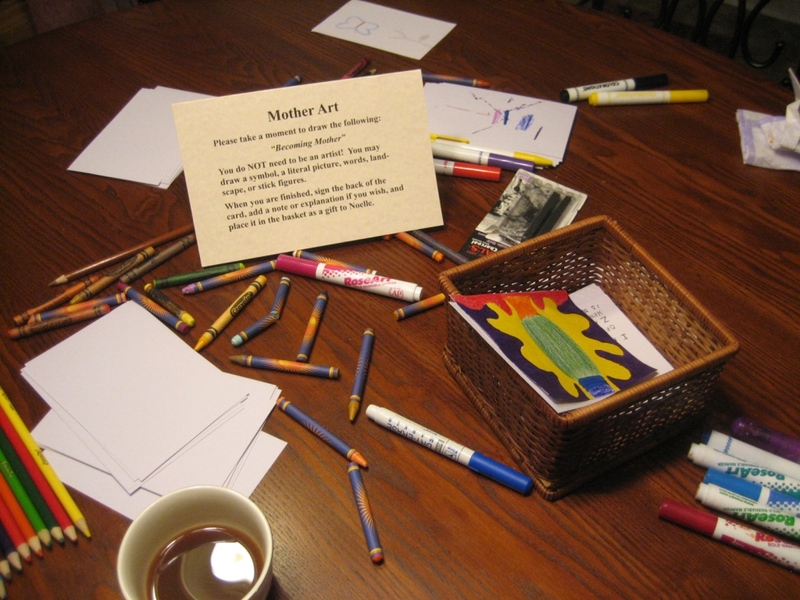 They were to create a piece of art called “Becoming Mother” as a gift for Noelle. Finally, my talented friend, Katy, henna’d Noelle’s feet. She also graciously gave each guest a small henna tattoo as a reminder of Noelle’s birth and transition into motherhood. The henna work was my favorite part of the blessingway. Now, we wait for sweet baby Asher. Posted in Birth, Family, Pregnancy and tagged blessingway, mother blessing. Bookmark the permalink. So beautiful! I can’t wait to hear about Asher’s birth! What a beautiful way to honor a new mother and childbirth.